There are few people more qualified than Jerry Ross to describe what it is like to launch into space. Retired after three decades as a NASA astronaut, Ross flew into space a record seven times. 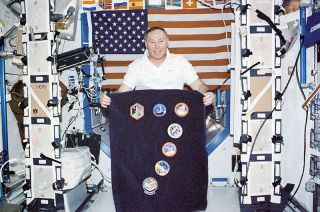 Over the course of his nearly 1,400 hours orbiting Earth — including almost 60 hours performing spacewalks — Ross helped save and deploy one of NASA's four "great observatories," worked at two space stations, and served the U.S. Department of Defense on a classified shuttle mission that he still cannot talk to this day. Ross recounts his experiences in his new autobiography, "Spacewalker: My Journey in Space and Faith as NASA's Record-Setting Frequent Flyer" (Purdue University Press, 2013), co-authored with John Norberg. collectSPACE.com, a SPACE.com partner site, recently spoke with Ross about writing "Spacewalker," his hopes for the book and his thoughts on the next generation of astronauts who will follow him into space, including perhaps his daughter. collectSPACE (cS):What motivated you to write a book? I always kind of somehow wanted to document what I had done in the space program, partly for my granddaughters who are too young to have experienced much about my flights at all. In 1998, I started getting into genealogy and that gave me a very good appreciation for people of earlier generations documenting things for following descendants. Front cover of "Spacewalker: My Journey in Space and Faith as NASA's Record-Setting Frequent Flyer" by astronaut Jerry Ross. So I ultimately decided before I retired that I would at least test the waters and see what it was like, if I could find somebody who would publish the book for me and things like that. Ultimately, it led to Purdue University. They were interested in publishing the book and helped provide John Norberg to be co-author with me and off and running we were. I guess there's one other piece of the puzzle to it, too. My entire career as an astronaut, they sent me out on public affairs types of appearances all the time. And I tried to concentrate on going to schools as opposed to Rotary and things like that. I wanted to try to excite young people about figuring out what their god-given talents were, then make plans for themselves based on those talents, and how best to then hone those skills, not only for their own welfare but the betterment of mankind. cS: Speaking about exciting youth about space, you write in "Spacewalker" about your own interest in space starting at a young age. They say that astronauts either know they want to fly in space their entire lives or end up doing so as a result of their career leading them to the opportunity. No one decides midlife to be an astronaut. Is that consistent with what you experienced in the NASA corps? Ross: I had a lot of friends all throughout my career who had very similar experiences to me in terms of at a very young age being excited about flying and then eventually about the space program. I wasn't as excited about flying as I was excited about getting into the space program. My goals initially were to get into the space program as an engineer and get my hands on the hardware and help to launch things. But as time went on and as we started to launch men into space, and as my career progressed and my education progressed, I saw and purposely followed as close as I could to the footsteps of the original astronauts and the subsequent men who were hired. That was one of the major reasons I went to test pilot school. I entered the Air Force the same year they started building the B-1 and NASA started building the shuttle. And they announced that they were going to have this category of astronauts called 'mission specialists' who could fly on the vehicle. My rationale was, so NASA originally wanted to hire test pilots for their earlier programs and now they've got this new program coming along and this new mission specialist category, it sure seems like engineers who have been through test pilot school and have become flight test engineers would fill a lot of squares, which NASA would be looking to include into their mission specialist category. So that was how I entered my career path. There were some people in the astronaut classes that I knew who applied for the program kind of on a whim, just to see if they could get another star, if you will, in their vitae. But very few of those stayed in the program very long. Most of those were a one or two-time flyer and then they were out of there because they weren't dedicated to getting into the astronaut office and helping to push back the frontiers for knowledge and explore space. They were more of "Can I reach the peak of this mountain?" Most of the people who stayed with the program for long periods of time and then basically dedicated their lives were the ones like myself, who had been desiring to be in the program and flying for basically their whole lives. cS: Do you think space exploration is still exciting enough in of itself to interest today's youth? Ross: The excitement has in some ways been taken out because it's a "been there, done that" type of thing and all the instantness of the current everyday life is what has been spawned from what we have done earlier. A lot of things of magic — the wonder of a black and white TV you see for the first time or watching a rocket launch for the first time — that's all gone. It's commonplace, it's everyday, you can almost say it is boring to people. And that's too bad. It really is. cS: How important was the influence and inspiration of the original astronauts to your own career in space? Ross: Even if we never had flown in space, ever, I still would have wanted to be involved in the space program and help launch satellites and rockets. Had we had never progressed beyond that, I would have still endeavored to get my engineering degree at Purdue to get involved in our country's space program. But as things matured and they started to launch men into space, essentially at the time I was graduating from high school and started to realize the fact I was going to make it into engineering and hopefully graduate and therefore have the credentials to get into the space program, then my focus started to alter some. Especially, as I explain the book, as NASA's astronaut classes started to include people who were not military test pilots. They started to include scientists and engineers. And of course, when NASA announced the space shuttle program and the fact they were going to have an entirely new category of astronauts who would be qualified solely upon their academics and work experience and did not include flying, that was a great opportunity for me. The timing was just perfect to get into the program upon those type of credentials and getting in on the ground floor for being a mission specialist. To me, the mission specialist category was the most desirable one, anyhow. Even if I had been a qualified test pilot, I would have rather done what I got to do than to be one of the front seaters in the space shuttle. In fact, I had several test pilot type people in the astronaut office, who were — though they wouldn't totally admit it — envious of what the mission specialist category people got to do on the flights, including especially the spacewalks but also the variety of things we got to do on each mission was a lot different from what they got to experience sitting in the front two seats. cS: You set a record becoming the first NASA astronaut to fly seven times to space, an achievement matched by only one other. How aware were you that you would break the record as you approached seven flights? Ross: I never went into it to break any records. Records are something that I think is a cause of what you do. In fact, as far as I am concerned, what John Young was able to accomplish in his career will never be surpassed. Maybe the number [of launches] has been surpassed, but just the things he did, when he did them and the style in which he did them, it's insurmountable. Certainly I was cognizant of setting a record — you can't hardly not be cognizant of it because of the press and everybody else who tracked such things and it ends up in articles. I personally thought that seven was a good start. I thought 10 was a nice round number, something that I was hoping to achieve — not because it was a higher number, but because it meant I would have more opportunities to fly in space and more opportunities to enjoy that experience with other crew members and to accomplish more in terms of the exploration of space and building the space station. Frankly, I believe, and am disappointed we aren't breaking records. Because if we were breaking our records then we're progressing further into space and that's what I want to see. Continue reading Jerry Ross' in-depth interview at collectSPACE.com to learn which of his seven missions were his favorite, his thoughts on the losses and retirement of the space shuttles and how his daughter is following in his footsteps.